Beauty and functionality make the KUP, automatic coffee machine for the café bar, a point of reference for today’s bartender’s and the lover of minimalist forms, embellished with bright panels and illuminated sides plus advanced technologically. By record is the temperature control of the delivery groups. The integrated management of consumption and utilisation of data are essential for those considering the quality a mark of distinction. Electronic control of the boiler water temperature. Precise adjustment of the brewing temperature (+/- 0.25°C). Sturdy push-button panel, with mechanical “soft-touch” coffee dispensing buttons. With BLS the machine sides are enlightened by multi-coloured led lights. You can set your favourite colour by choosing among the countless shades of the colour mirror. Programmable night cycle: reduces energy consumption. 20amp Socket for Machine and 13amp Socket for a Grinder. Includes 1 x Black Eureka Zenith 65e On Demand Coffee Grinder and 1 x Black Stainless Knock Drawer. Heavier duty grinders and a choice of colours are available upon request. Includes basic installation, setup and training on how to use the equipment. 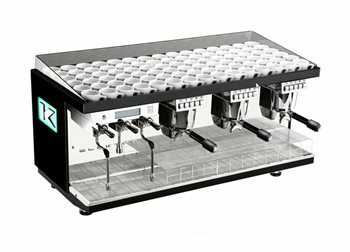 With over 20 years experience within the coffee industry, a team of engineers and a warehouse full of spare parts The Espresso Shop is not only an online coffee/equipment supplier. We can also organise any servicing and repairs at our workshop or your place of business including warranty work on equipment purchased directly from us. Please CALL or MESSAGE us if this machine is showing out of stock or you have any questions. We have a team of engineers and coffee experts on-site who are happy to answer any queries. Sign up to our Newsletter for great weekly offers! Be the first to hear about our new product arrivals, offers and latest news.